Is the success of motion capture in modern cinema because of the efforts of actors or animators? The battle rages on. The point at which I realized I'd stopped being (intellectually) a child and had become an adult was, I think, the point where I realized that despite the supposed impossibility -- this technique was frequently used to blow up robot-brains on Star Trek -- it was in fact totally possible to accept two seemingly contradictory concepts as fact and still function. Because the real world runs on pragmatism and compromise, not idealism or philosophy, so yes, damn it, it is 100% possible to be in favor of this or that bending of "the rules" when it benefits you but also 100% in favor of the rules standing hard and fast when bending them would hurt you -- and you can call that being a "hypocrite," but I prefer the term "guy who actually gets things done." An exceptionally visible example of contradictory-facts adherence in the movie business is The Academy Awards (aka "The Oscars,") which almost everyone whose business involves thinking about such things holds the following to be true about: The Oscars are basically a popularity contest with next to no actual merit as an appraisal of artistic achievement... But they're also an honor to receive and a validation for the recipient. There's a business aspect to that, to be sure -- the Oscar is culturally ubiquitous enough that having one is simply terrific from a self-promotion standpoint (i.e. maybe now you'll get job offers from projects that want to effectively "rent" your credibility as a winner), but it also goes deeper than that. At the end of the day, it's nice to get a trophy and be told you did good. Which is why every few years as the movie industry undergoes this or that tectonic shift in terms of what can and can't be done onscreen, a debate erupts over if and how certain disciplines can qualify for certain awards. Is it fair for traditionally-animated films and computer-animation to compete in the same category? Should a character-makeup that requires extra offscreen puppeteering get to compete against traditional "pieces of stuff glued to the actor" makeup? Can a voiceover performance be nominated alongside a physical one? For a while, The Academy even handed out separate Best Picture awards to color and black and white films for precisely these reasons. Technically, there's no rule against it, largely because nothing close to that technology existed when these rules were being written...but everyone involved is well aware of the firestorm of criticism that such a nomination would result invite: It's almost a given that at least one "rival" actor (or one rival actor's agent, via a press "leak") would voice complaints about the comparison being unfair, possibly even in a formal complaint the Screen Actors' Guild, which has been paranoid about seeing the profession undermined by so-called "synthespians" for years. At the center of this controversy from what was essentially its inception is, fascinatingly, a single man: Andy Serkis, who first captivated audiences worldwide with his groundbreaking turn as Gollum in the Lord of The Rings movies and is receiving similar accolades for his sophomore turn as primate revolutionary leader Caesar in Dawn of The Planet of The Apes. 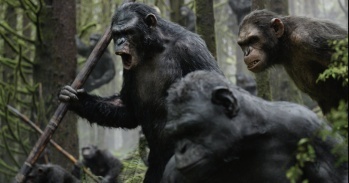 A plentitude of Apes and LotR fans, along with a growing number of critics, have been stumping for Serkis to receive an acting nomination for his "mo-cap" roles for years, and the actor himself has never been shy about considering roles like these worthy of the honor -- but not everyone agrees, and in a surprising turn the most recent pushback is coming not from fellow actors... but from animators.